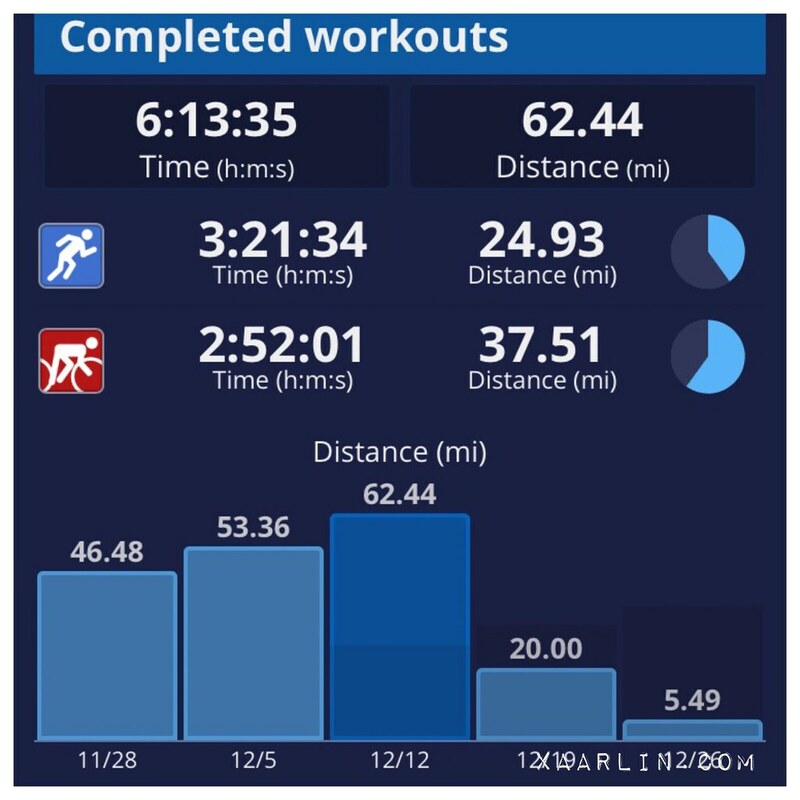 December 12, 2016 I started training for Boston. 20 weeks to go, yay! (Such a loooooong time- compared to my usual 10 week focused plans). The first week of workouts went well and felt good. My Daad sent me photos from my first marathon, NYC 2002 recently. I honestly didn't think we had photos of us crossing the finish so I was floored to see them! It's insane to think I've taken off 2+ hours from my first marathon 5:35 to my PR marathon 3:28 in 2016! It's so early in the cycle to decide on a goal for Boston, but to train well I need to have some sort of target time in mind. I'd like to requalify for Boston 2018- which means a sub 3:40 (more like sub 3:35 to guarantee registration) for me since I will be in the next age group for 2018. Either this cycle or the next (should there be another 26.2), I'd like to train for another breakthrough PR- sub 3:20 or something. Since I'm not training for a Full Ironman anytime soon, I'll be focusing a little more on running than I did when I trained for Carmel. I'm using the Hanson Advanced plan and will amend it to include some cycling and eventually swimming. It worked really well for me last year, so I'll try something similar again. I also want to do a half Ironman at some point, so I need to be cycling and swimming- plus I can't neglect Mortadella. Cycling also helps me stay injury free. A win win win all around! I'll also be doing yoga a few times a week- from Jasyoga. Strength training and PT exercises are also happening regularly. I'm 8+ lbs heavier than I'd like to be for running, so focusing on nutrition (and not binge eating, and drinking less alcohol), will be a priority for me this cycle. I love food too much and don't have an off switch, so this will be a challenge for me. Weight aside, my body fat percentage according to my fancy scale is around 25-26% which is too much for my frame- especially given how much I work out. Ideally I'd like to be around 20%, which doesn't seem like a big difference, but has been so hard to move so far. Body fat % trumps weight for me- I need to get leaner because of belly fat and the diseases associated with it. I'm going to take each day at a time and not think about the race being so far off in the future. I'm excited to run this race, but I need to put in a lot of work over the next few months. Looking forward to reading about your training! One day I would also love to qualify!! 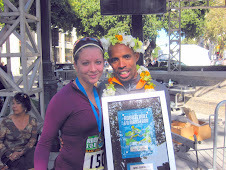 I am using the Hansons beginner's program for my half marathon in March. Which scale do you have? I am curious to see how you amend your plan to include cycling and swimming. You can totally qualify! It's just consistency over time without injuries, at least that's my formula. :) Ive got the Fitbit Aria scale- I love how it updates to my Fitbit. I'll probably swap a mid week long run for a longer trainer ride, and then add a brick, and also a longer weekend ride again. Fit in a swim whenever I can. 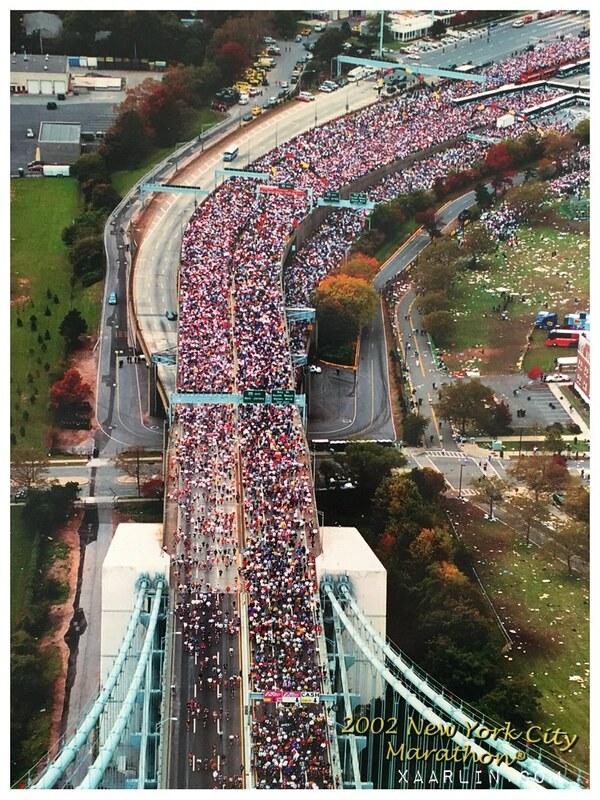 Love the pic from the '02 NYC Marathon! 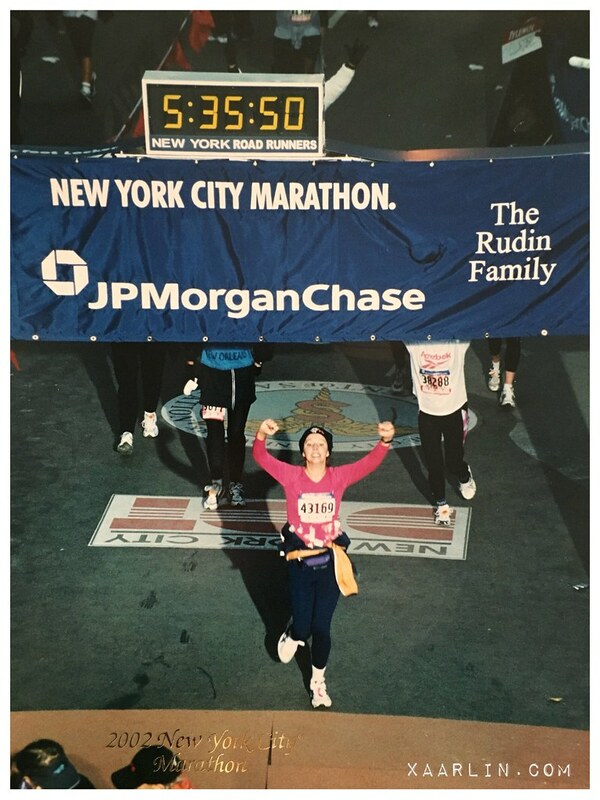 NYC is the home to my slowest marathon ever, but it was my favorite ever. Anyway, good luck with your training. I like how you are incorporating other disciplines in your plan. If and when I pick another marathon I will try and throw in some cross training for the main reason that I don't want to overdo the running and burnout before the race. Anyway, you will likely naturally get leaner the closer to the marathon you get. In addition to the extra calorie burn from high mileage, when the race gets nearer I am more focused on filling up with proper fuel (whole milk/yogurt, cheese, nuts, eggs, steak etc.) and then the excess weight comes off. I think NYC is my favorite marathon too :) I think the cross training will benefit you a lot- it got me a 7 min PR in Carmel last year despite less running. It also kept me engaged with running and everything because I wasn't running all of the time- it was always seemed fun to train. That's true about getting leaner/lighter as training goes on. I just over indulged way too much during IM training and now I feel like a Porkey slug. Making good food choices + better training will certainly change that quickly. I can relate to everything you wrote about body fat. I'd really like to lower that for myself as well. I've been really focused on strength training and trying to limit my cardio to just running. BUT. I know my diet makes a difference too.